Is this online course for me? or if you want to become a face painting instructor and you need to gain confidence in your skills and find out how to build an effective educational program. What does this Course include? Are we going to practice? 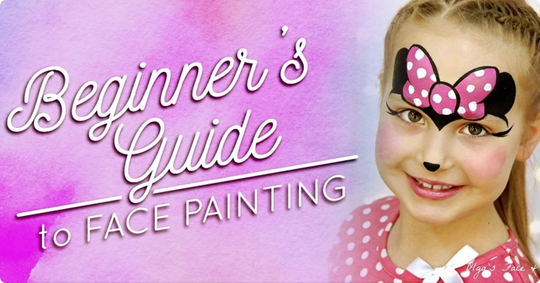 This Course includes EVERYTHING about face painting. All the knowledge we’ve gathered and skills we’ve developed over many years is available here and now for you to discover. 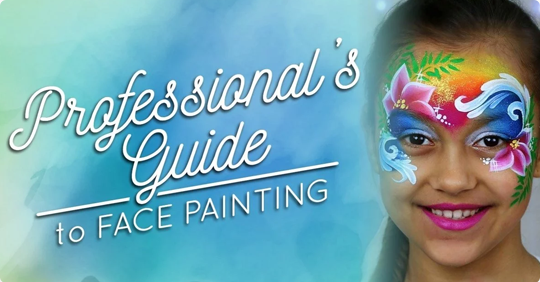 All theoretical basics, all practical skills and all our professional secrets to help you fast-track your professional face painting career — these will all be unlocked for you in this one-of-a-kind online training program. There is going to be lots of practice along the way — from quiz tests and practical tasks to evaluation tests and the final exam. By enrolling in Elite course you get the ultimate opportunity to receive one-on-one feedback and useful recommendations from your instructor for one year. What is the difference between Professional and Elite packages? The main difference consists in the individual tutoring that is offered during the training on Elite сourse. This means that your instructor will check each of your tasks and will give you valuable feedback on how to fix your mistakes and how to improve your designs, in other words — how to get the most of these studies. 1) Diploma of Graduation — fully accredited by IAO.org (International Accreditation Organization) — that will confirm that you gained the Status of a Certified Professional Face Painter. 2) e-Badge "Certified Face Painter" — an Exclusive School Symbol that can be used as a watermark on your artworks and on your website. The term for individual feedback for the Elite course is 1 year from the start of the сourse. This is more than enough time to complete the training, get a Diploma and continue to enjoy lifetime access to the course, closed group and webinars. Students on Professional сourse study individually. At the end of their studies, after passing all the theoretical tests from the сourse, they will receive a Certificate of Completion. What does International Accreditation mean? 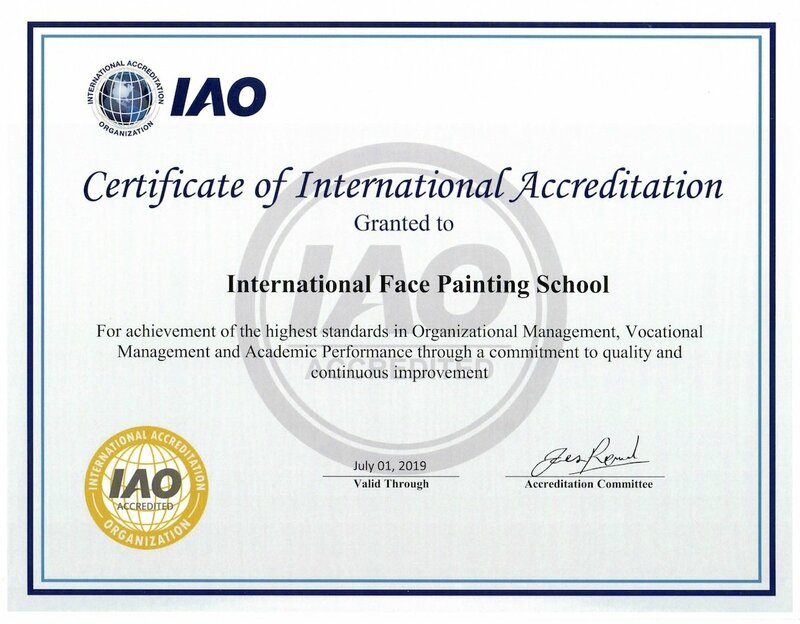 The International Face Painting School, the entire educational program, and all its instructors are fully accredited by IAO.org (International Accreditation Organization). It means that we have passed a very strict and extensive process by IAO committee members and have received approval and accreditation status by the internationally certified evaluation commission. Here is the link to Certificate of International Accreditation. How the payment is made? Is it possible to pay in installments? You may request a 100% money-back for both Professional or Elite Course during 90 days from the beginning of the studies. The refund will be made in case you were not satisfied with the results achieved after completing the entire educational program, done all homework, passed all evaluation tests and painted all designs included in the Course. When will the Painting Course start? Are there any time limits? As soon as your enrollment is confirmed, we will give you access to the first module. From that point on, every few days you’ll receive an email which will open the door to the next module, and so on. For students on Professional сourse, it will take minimum 2 months to complete the studies and receive the Certificate of Completion. However, there are no time limits in your access to the course content. You can move at your own pace and complete the program at your own pace. Whether it takes you 3 months or 3 years, once you purchase this course, it's yours forever. For students on Elite сourse, we offer a limited number of spots every 1st date of every month, with the studies starting on the 15th of the month. You get lifetime access to the сourse content and 1 year of additional individual feedback with our School certified instructor. How do I access the Course? Can I download it and share my subscription with a friend? Access to the Course is made online, through your account on the International Face Painting School website. All you need is a device through which you can access the Internet. It can be a PC, a Mac, a notebook, a tablet or a smartphone. You can access it from any place in the world, 24/7. The Course is designed for individual education. There are such personalized elements included like evaluation tests, webinars, practical tasks, final exam and certification that make it impossible to share with another student. It is forbidden to download and share any course content.